One of our favorite occasions to dress up for (and excuse to shop for) are weddings! Summer weddings are even better because you get to adorn the prettiest floral prints whether the event is outdoors or indoors. 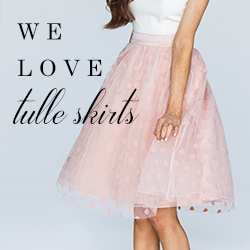 Many of our new wedding styles are perfect for both casual and dressy events, and we’ll let you know why below! Floral maxi dresses are great for casual weddings, especially the new flowy styles we have in store! Whether it’s our pretty off the shoulder dresses like our Karina Peach or Yellow Maxi Dresses, you’ll match the Summer florals at the wedding while making everyone #ootd envious! If you prefer shorter styles, we have a selection of cute floral dresses that vary in length like our Cassie Multicolor Floral Fit and Flare Dress. The best thing about these gorgeous floral dresses is that you can wear them again and again for the rest of the season (none of that wear once & store away nonsense)! Lace is a great way to go when you’re attending a dressier upscale wedding. You can’t go wrong with a pretty lace midi dress like our Maya Blue Lace Halter Midi Dress that’s a gorgeous shade of Summery blue! If you’re a maxi girl instead, our fan favorite Camila Lavender Lace Maxi Dress has a gorgeous mermaid-cut silhouette that is flattering on all body types. 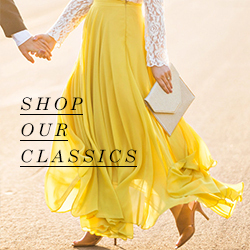 Our irresistible best selling Amelia Full Yellow Maxi Skirt is a must-have closet staple that can be dressed up for your next warm weather wedding! This flowy maxi skirt is bold and bright and will guarantee you’ll stand out among the crowd. If you’re looking for a floral print maxi skirt instead, our Carrie Navy Floral Maxi Skirt is just as gorgeous and flowy as our Amelia, with the prettiest floral pattern and gorgeous hue of navy blue! Pair these skirts with our cute crop tops for a flattering fit and flare ensemble! Once you’ve picked out the perfect wedding style for your next event, don’t forget to finish the look with one our gorgeous statement necklaces and feminine handbags! We’re all about the every-girl here at Morning Lavender, and love finding pieces fit for every shape and style! Discovering each unique quality of all the different face shapes we meet or come across makes it both challenging and fun finding ways to flatter every one! Our wide selection of sunglasses is carefully curated and chosen so that we can accomplish this task, and here’s some styling tips below! The shape: Tapered chin, wider cheekbones, & an angular jawline. Goal: To balance the widths of your face. The shape: Equally wide and long, with greatest width at the cheeks. Goal: To provide contrast to your face. Goal: To give contrast to facial curves. Avoid: Frames that are too large for your facial features. The shape: Forhead, jawline and chin are about the same width, & a strong jawline. Goal: To add contrast to strong facial features. We hope you found these tips helpful in finding your new favorite pair of sunglasses! Don’t forget to check out the rest of our Summer accessories here!